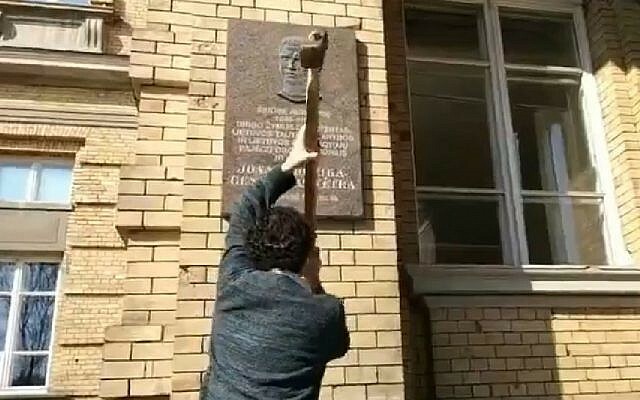 JTA — A Lithuanian lawyer smashed a controversial plaque honoring a Nazi collaborator in Vilnius, which a local court recently ruled may stay. Stanislovas Tomas, a human rights lawyer running for election to the European Parliament, was filmed smashing the plaque honoring Jonas Noreika on Sunday and streamed it on Facebook. He reported his actions to police and waited to be arrested next to the plaque with a sledgehammer. Last month, a Vilnius court dismissed an American Jew’s lawsuit against a state museum’s glorification of Noreika, citing the complainant’s “ill-based” intentions. The claimant, Grant Gochin of California, said he would appeal to the European Court of Justice. 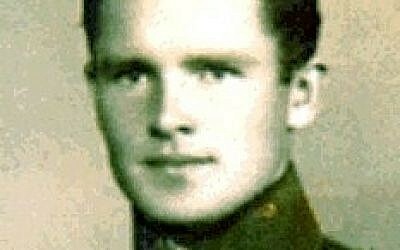 He sued the state-funded Center for the Study of the Genocide and Resistance of the Residents of Lithuania for erecting a plaque honoring Noreika, a local anti-Communist hero who died while in Soviet custody. In documents submitted to the court, the center claimed Noreika’s actions could not be judged posthumously and that in any case there is no evidence to suggest he perpetrated war crimes.